Leaving aside Shakespeare, Chekhov and Ibsen, the popularity of playwrights tends to wax and wane on the London stage; the recent reappraisal of Rattigan as someone unfairly cast aside by the Angry Young Men of the 1950s and the continuing absence of Bernard Shaw are two of the more obvious examples of the way a writer’s fortune remains tied to the whims of producers. The UK has also notably never quite embraced the rich vein of talent that exists in European theatre: Racine is rarely seen; Moliere, a mainly absent figure; and modern continental playwrights virtually non-existent. The thrall of Anglo-American naturalism and the rawness of the grand narratives of O’Neill, Williams and Miller continues to be preferred to the rather more metaphysical questions posed by the likes of Ionesco and Artaud. Within this structure Brecht cuts a solitary figure, and has increasingly become something of the forgotten man of British theatre. Whilst his position, alongside Stanislavski, as one the pre-eminent figures in the development of modern theatrical practice is assured, it was Stanislavskian concepts that became the dominant mode of theatre and film; championed by Stella Adler and embodied in the work of a young Marlon Brando. In comparison Brecht’s influence has seemingly ebbed away to the point where a new production of a Brecht play in the West End is something of an event. One must acknowledge that there are resource considerations to this; large casts can be ruinously expensive but that reality is built on the premise that Brecht is deeply unfashionable and cannot be considered an audience draw. The irony’s that Brecht is perhaps the most American-looking of all the European playwrights. Stanislavski had little desire to cast his eyes across the Atlantic but to Brecht the new world and its eager embrace of democratic and technological progress chime with ideas that were central to his own theatrical philosophy. At its heart was the development of an art form that would become pre-eminent for the first five decades of the 20th century: cinema. Silent cinema was the great leveller; reliant on music, gesture and simplified dialogue so it could appeal across the immigrant communities of America, these early pictures represented Brechtian techniques transposed to a medium that could truly be embraced by a mass audience. It was within the world of cinema that Brecht found a way of telling the story of Hitler. The development of genre pictures – particularly the early gangster movies, starring the likes of James Cagney and George Raft – gave Brecht a mechanism with which the rise of an international dictator could be challenged in a way that did not need threaten the authorities directly and would also appeal to a mass audience. This is not to say that Arturo Ui is dumbed down; the reverse is in effect true, Brecht is raising the genre picture above its humble origins. He may have gained a reputation as a didactic playwright with a sledgehammer touch but this is to ignore the craft taken over the formal structure of the play and the sly literary references liberally sprinkled throughout the text. Arturo Ui could be enjoyed for the wonderful pastiche of Mark Antony’s oration at Caesar’s funeral and the knowing nods to pretty much every tragedy in the Shakespearian canon but it does more than this – it recognises the freedom of the theatre, in opposition to the limitations of cinema, to challenge the audience by upturning the established conventions of an entire genre. The introduction of the Hays Code guaranteed the ending for any gangster film. Simply put, the anti-hero lead could not be allowed to get away with it. The Code was one of the key tools of America’s powerful religious lobby in controlling the country’s moral centre and, in collaboration with the studio system, was the ultimate in patriarchal prurience; it pragmatically allowed the audience to receive its jollies but by the end of the picture they must have learnt what the price is for acting outside of society’s norms. The beauty of Arturo Ui is the dissonance that exists in the audience between the awareness of the genre conventions and the knowledge of how the story must end. Arturo Ui is such a compelling creation that it is hard not to be sucked in by this most pathetic of leaders – even, at times, rooting for him despite the knowledge that he is nothing but a cheap parodic stand-in for Hitler. As the play continues that the audience must face the truth that was self-evident from the start; that there is no redemption and no punishment for Arturo Ui. It is interesting to consider how few people took on Hitler directly; plenty of films focussed on the perils of fascism but much fewer took on the spectre of the man himself. However Brecht believed, as Chaplin knew, in the power of comedy to bring great men low; to show that those we place on pedestals are made not of marble but of flesh and bones. The Great Dictator showed us the innate absurdity of Hitler; Arturo Ui, written by Brecht a year after Chaplin’s film, follows a similar line but goes further. In showing Ui’s rise to power, Brecht is seeking to demonstrate the prophetic truth of Edmund Burke’s words two centuries earlier; that ‘all that is necessary for the triumph of evil is that good men do nothing’. The power of desire, or its reverse, the desire of power is something that is consistently underestimated and the tragedy of the play rests in its title; it very much was a ‘resistible rise’ but one that did fail to be resisted. 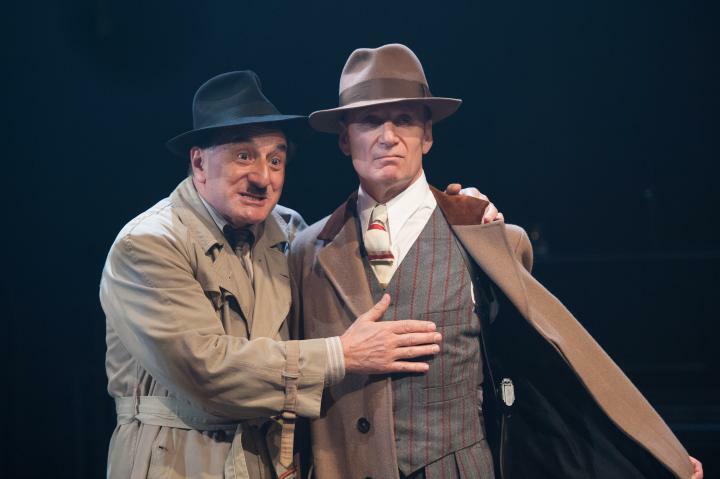 Henry Goodman, as Arturo Ui is superb in this production, which is yet another in the long-stream of excellence to have come out of the Chichester Festival. His performance is set in a hunched, grotesque manner, and his Ui channels a fearsome animalistic roughness. It is this explosively, volatile, street-fighting spirit that is both repellent and captivating; and this duality of character is perfectly captured by Goodman. 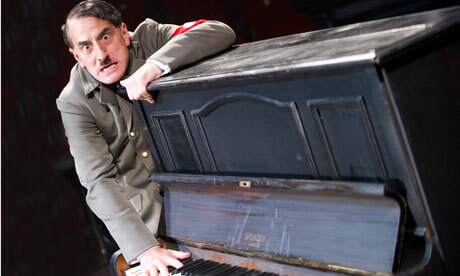 Strong as the leader, Goodman is also able to find the hint of the vaudeville that Brecht clearly intended; he brings a lightness of touch that helps draw out the absurdity of the comedy, for instance startled by a noise his pratfalls around the piano are reminiscent of Chaplin and Keaton. The supporting performances are well-judged throughout, in particular William Gaunt’s Dogsborough (who represents Hindenburg and the failure of the German establishment) brings a tragic grandeur to the role; aptly played as a southern gentleman who finds that long-held manners and reputation are all too easily betrayed by one moment of weakness, and all-to-late realising that he is operating in a world that has passed him by and where old rules no longer apply. Above all this play belongs to Brecht; it is the greatest distillation of his particular art. The confident mixture of high and low culture is breathtaking; a gangster play that is written, for the most part, in an earthy iambic pentameter. It immediately alienates whilst drawing in the audience with the rhythmic patterns. Throughout Brecht tips his hat to Shakespeare, and it could be read as a pointed statement that whilst Shakespeare created the greatest tragedies for the stage, the greatest tragedies must play out on much grander stages, with much wider consequences. It is telling that it is to the real-life Julius Caesar that Brecht makes his most frequent references and Mark Antony’s reference to Brutus as a ‘honourable man’ takes on a witheringly mordant quality through its repetition. This is a fine production of a great play. Brecht was a prolific playwright who continually sought to hone his craft. Much of his work may be commercially unviable, and potentially unstageable, however to lose one of the great overtly political writers to the annals of history would be a tragic loss when there is still much that could be said. Even if we do not see the return of Brecht to the mainstream it is worth considering the argument recently put forward by Michael Billington that Brecht’s ultimate victory can viewed through the way that so many of the techniques he championed have become part of the modern language of theatre.